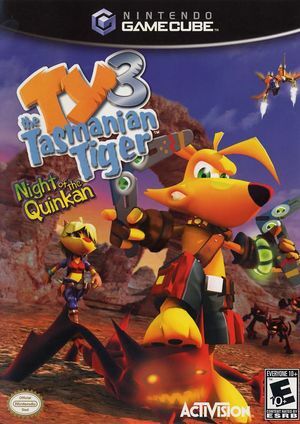 In Ty the Tasmanian Tiger 3: Night of the Quinkan Ty and his mates face their biggest challenge yet - an otherworldly invasion by an ancient evil known as the Quinkan. With Bush Rescue disbanded, Ty begins the challenging task of reforming his team and leading the fight against the dark oppressors. In this next chapter, players will embark on a series of engaging missions and challenges filled with new and upgradeable weapons - including his trade mark boomerang collection -- and vehicles. Ty's new adventures will take him into a shadowy world full of dangerous creatures, and will see him face bigger and badder enemies. Ty the Tasmanian Tiger 3: Night of the Quinkan has a native 16:9 display option, but it requires enabling it in its internal options and setting Dolphin's Aspect Ratio graphics setting to "Force 16:9". Using the widescreen hack with this title is not recommended. The graph below charts the compatibility with Ty the Tasmanian Tiger 3: Night of the Quinkan since Dolphin's 2.0 release, listing revisions only where a compatibility change occurred. This page was last edited on 18 March 2019, at 08:21.